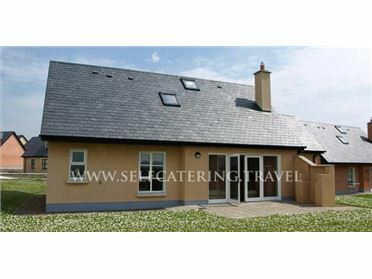 Doonkelly Farm Cottage is a detached cottage near the town of Sligo in Ireland. It has four bedrooms made up of four doubles, on has an en-suite, and one single room, there is also a family shower room, the cottage can sleep five people. Also inside there is a kitchen, a living dining room and a sitting room with an open fire. To the outside sits off road parking for three cars and open fields to the front of the house. Doonkelly Farm Cottage is a charming cottage in a great secluded location. Oil central heating with open fire. Gas oven and hob, fridge/freezer, washing machine, TV with Saorview, selection of books and games. Fuel, power and starter pack for fire inc. in rent. Bed linen and towels inc. in rent. Off road parking for 3 cars. Open fields to front of cottage. One well-behaved dog welcome. Sorry, no smoking. Shop and pub 4 miles. Note: A few low doors throughout the property so care should be taken. .